We’ve had so much fun supporting No Kid Hungry in their #90Meals campaign this September and it’s not over yet! Go to http://www.nokidhungry.org to see how you can help end childhood hunger in America. My kids became more aware, good conversations were started and now they want to do more to help others. This is just a small first step. Do good. Dine out! Last night we headed to Joe’s Crab Shack for one of the approximately 90 meals we will eat this month. My kids are not the most adventurous eaters and were a bit apprehensive about going out to a restaurant they had never been to before. There was a lot of “but why can’t we just go to Chik-Fil-A” type comments. I explained to them that only certain restaurants are participating in this campaign to help kids who don’t have enough to eat and that I was sure we could find something on the menu they would like. They were happy (and I was relieved) to find some good old fashioned chicken strips on the menu. I had blackened Mahi fish tacos and they were very good! This is what ‘Win Win’ looks like when you Dine Out for No Kid Hungry as part of their #90Meals campaign throughout September! We had a blast taking these pics and the conversation quickly turned from apprehensive to “when can we come here again”. We discussed the fact that no matter where you live there are, more than likely, kids that you know who might not have enough to eat. We talked about what it means to feel hungry – they are both “starving” on a daily basis when they walk in the door after school. I asked them how they would feel if there were no snacks or even a glass of milk to look forward to. I could see them connecting the dots as Syd reminded me of how I’m always nagging them not to pour too much milk in their cereal because I hate pouring half of it down the sink. Depending on where you live and whether or not you choose to buy organic milk, it can cost as much as $6.49 a gallon! Most importantly, on our drive to Joe’s, we talked about the day – 9/11 – a day to never forget. We talked about the heroes who took action and died to make sure another plane wasn’t crashed into a building. We talked about never taking even the smallest things in life for granted. As we walked out, they were already planning their next #90Meals photo op and discussing how we should ask some of our favorite local restaurants to participate next September. You can help too! 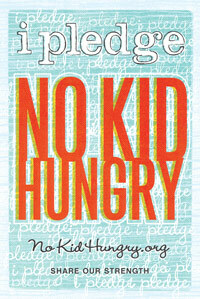 Find participating restaurants in your area simply by entering your zip code at No Kid Hungry. Please do. Stay tuned, we’ll be dining out again soon and September 20th is my official day. In a perfect world, no kid would ever be hungry… especially not in this land of over-indulgence and abundance, America. Washington, DC – For many children, summer is a time for friends, vacations, and carefree days in the sun. But for the millions of children who rely on school meals, the summer months can be a time of uncertainty and hunger when those meals disappear. The federal summer meals program helps children get the healthy food they need when school is out. These free, healthy meals are available to kids and teens across the country, but only a fraction of those in need have access. Forty-three percent of low-income families find themselves without enough food when school lets out. Many parents don’t even know the summer meals program exists. Take the pledge – which takes about 30 seconds and costs nothing – to end childhood hunger and join #TeamNKH. Help #SaveSummer with your Smartphone!